"You race motorcycles on ice, are you crazy?" You bet, and it is one of the greatest sports in the world. In the USA there are thousands of motorcyclists who stud their tires and race on the ice in the winter. First, you have to live where there is ice on the lakes in the winter. 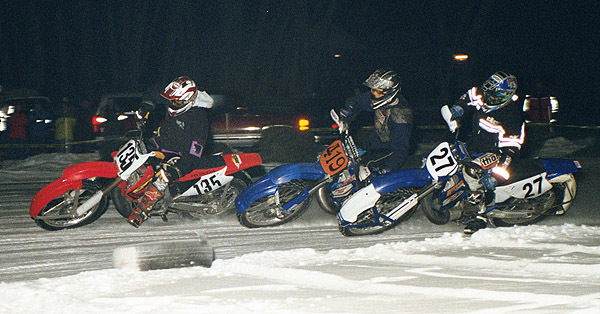 The vast majority of motorcycle ice racers live in the Midwest and the East Coast. Millions of hex-head sheet metal screws are sold and thousands of tires are studded up. Let’s start from the beginning. I have seen films of bikers from the Milwaukee Area riding their motorcycles with sidecars to the lakes and racing on the ice in the 1920’s. In one of the films, the starter of the race would stand in the sidecar and wave the flag and the group of sidecars would take off, racing around a ½ mile oval. Although I could not tell from the film how many laps they raced, it sure looked like they were having a great time. 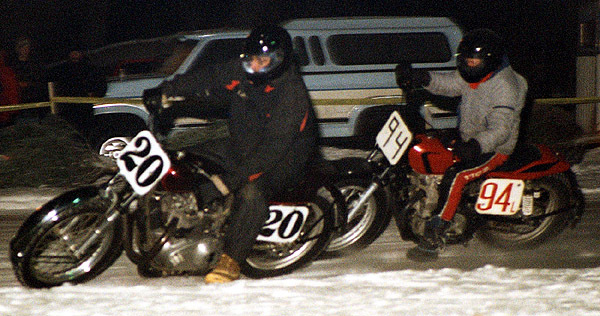 I have also seen a 1950's era Harley-Davidson set up for ice racing. Back then, they would take a standard 530 drive chain and wrap it around the front tire and have pieces of chain wrapped around the rear tire. Let me explain how this was done. With a deflated front tire, a chain approximately 75 inches long was wrapped around the outside of the tire. After installing the master link, the tire was inflated and the chain was in place for steering. On the rear tire, eight to ten pieces of chain ten inches long were spaced and installed around the rim and tire. After installing the master links, the tire was inflated to hold the pieces of chain in place. This set-up provided traction for the rear tire. I saw my first ice race in 1971 at the Mineola Resort on Fox Lake, Illinois. At that time a number of riders plowed an oval track and spent the day racing around. The used various kinds of dirt bikes using hex-head sheet metal screws in the tires. Back in those days, the biggest race in this area was the Lake Geneva race organized by the Ulicki’s from Kenosha. They plowed a ½ mile track on the ice. I remember racing there in 1973. There were about 100 racers entered in 7 different classes. I put together a ’72 Yamaha DT250 that was just junk. Back then, I didn’t take ice racing seriously. I do remember how fast the good guys were going. Another big race was held at Brown Deer Park in Milwaukee. Rich Waldbuesser (22) charges on his 600 Yamaha into the first corner of the Plus 50 Final with Robert Smith (4) holding the inside line on his 426 Yamaha. In 1976, I organized weekly motorcycle ice races at the Mineola. This weekly program had a regular class structure and trophies. We raced every Sunday, January through early March. During this era, the Gold Screw was introduced. Developed by Bill Sparks and Don Herring, the Gold Screw was a great improvement over the general hardware store screw used. Built to the allowable 3/16 of an inch height and available in various lengths from ½ inch to 1 1/2 inches long, this design greatly improved the traction on the ice and increased the speed. Ice racing became a very high-speed sport. Tyler Smulders sweeps the Amateur classes by winning in 200, 250 and Open. 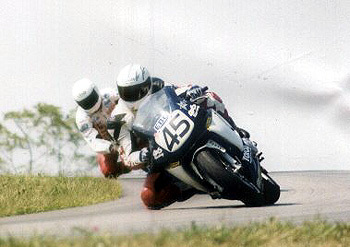 I joined forces with Bill Sparks in 1983, and we promoted the AMA Amateur National at Lambs Farm in Libertyville, Illinois. This venue and the following Midwest Championship in ’84 and the AMA National again in 1985 became the biggest races of the ‘80’s. In 1987, I started the television show, Team Chicago Challenge, and hung up my promoter’s hat. I now travel to and shoot the racing action and let others do the promoting. I have been racing my 1989 Yamaha YZ250W for the last 7 years. This is my favorite motorcycle. It does everything right. Over the years, and building many ice race tires, I still don’t feel that I know the ‘trick’ to the perfect ice race tire. So I smarted up and now I just buy my tires from Jeff Fredette. This 20-time ISDE Gold Medallist knows how to build tires. The first time I raced with Jeff’s tires, I thought I died and went to heaven. They are that good. You definitely have the edge. 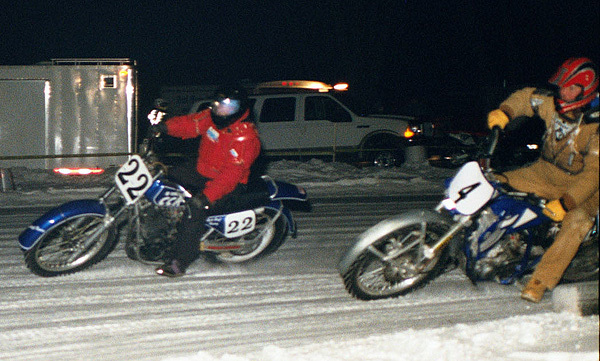 The 2002 Ice Racing Season kicked off at The Sunset Tavern and Marine on Lake Koshkonong near Fort Atkinson, Wisconsin on Saturday night, January 5th. 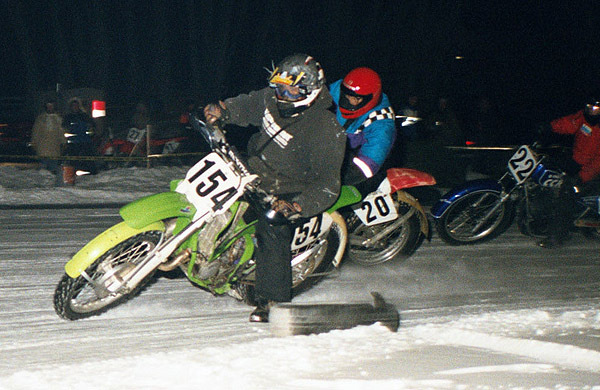 Tom Gimmer, a former motocrosser, plows a small short-track in front of his tavern and lights it with construction lights. Eight classes for motorcycles are raced and he pays cash. Approximately 60 ice racers showed up and the racing was fierce. 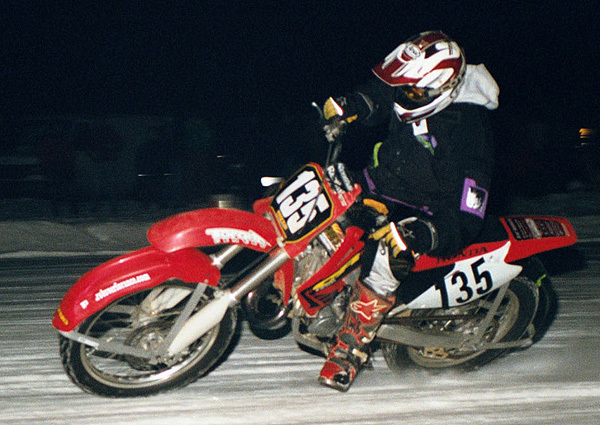 Roy Nafzger was the ‘king of the ice’; winning the 250 Pro, Open Pro, Plus 40 and the Dash for Cash. The next day, January 6th, the action moved to Lake Wisconsin with the Southern Wisconsin Ice Race Association. This group promotes races for both motorcycles and quads. They build two tracks, an oval and a TT track, in and around the oval. This group caters to the beginners on quads. They have races for studded and unstudded quads, beginners, novices and pros. With 28 classes, it is a full program. They have eight classes for motorcycles. Again it was Roy Nafzger with the hot hand as he won 250 Pro, Open Pro, and Pro TT. Boyd Calvert was right on his rear wheel in all three classes, but ended up with second place money. A young racer, Block Schwarzenbacher, won the Schoolboy 125 class. One of the best night races took place on January 19th. A good number of great racers came to do battle at the Sunset Tavern & Marine. Tyler Smulders of Watertown, Wisconsin charged to wins in the 125, 250 and Open amateur classes. In the Pre-80’s Vintage, it was Dan Luchon on his 750 Triumph dirt-tracker thundering around the ice short-track to win. Brad Taylor dominated the early laps of the 10 lap Open Pro class until Roy Nafzger bolted to the win. Roy also won the 250 Pro and Plus 40 class. I could only muster a 2nd place on my grandson’s KX125, finishing ahead of Rich Waldbuesser on his 600 Yamaha and falling victim to the charging Bob Smith on his 426 Yamaha in the Plus 50 class. In the Dash for Cash, it was the young Tyler Smulders starting on the amateur line charging to the lead. Roy Nafzger wasted no time starting on the handicapped Pro line (60 yards back). On the sixth lap of this 10 lap race, Roy caught and passed this young up-start to gain another victory. On Sunday, January 27th, I traveled to Castle Rock Lake just past the Wisconsin Dells to race with my friend, Larry Strangfeld and the Central Wisconsin Ice Racing Association. What a day for ice racing! It was sunny and 50 degrees. There was still 9 inches of ice on the lake, but no one was allowed to park on the ice with their trucks, vans or trailers. The parking lot was big enough and everyone just unloaded their racing equipment. With a short practice, we were ready to race. Charging in the Open Pro Motorcycle class was the Moose man, John Strangfeld, on his big bore Kawasaki. Pat Bean and Lance Wollin on Yamahas tried to overcome the Kaw, but had to settle for second and third. In the Pro Vet class it was Gerry Thrume on his Rotax claiming the win. Pat Bean held off Matt Glodoski and Cliff Eckes in the 250 Pro Class. 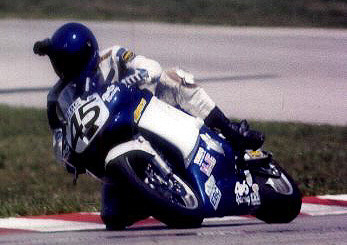 Scott Bushman won the 250 Amateur class and settled for second in the 200 class. Seb Boge got the win in 200 with my grandson, Brandon Griffith, claiming 4th for his best ride of the season. Willie Thomas was the winner in the Vet B class, and I had to settle for 4th on my Yamaha. I finished 3rd in the Open GP race with John Strangfeld winning and Pat Bean Second. Of the 15 races for quads and the illegal three-wheelers, it was the Outlaw Pro Rubber ATV class that offered the most action. Pitching it in half way down the straightaway, these three-wheeled Hondas, slip, slide and drive around the oval. When the snow-dust cleared, it was Tim T. with the win followed by Scott Linder and Brandon McCarthy. In the Pee Wee ATV class, young Corbin Kostyn drove his 25 year-old Honda four-stroke 70 three-wheeler to win over the more modern quads of D.J. Spurlng and Eric Schafer. Back to Lake Wisconsin on February 3rd with the SWIRA. With some fast riders from Illinois to challenge the Wisconsin riders, the showdown started in the 250 Pro Class. Jerry "Mr. Ice" Westhouse from Illinois on his new 450 four-stroke Honda battled with Roy Nafzger. But at the end it was Nafzger at the line. In the School Age bike class, Brock Schwarzenbacher led every lap but Brandon Griffith rode a solid second. It was Illinois Harley-Davidson’s Tim Farrell who finally beat Roy Nafzger in the battle to the line in the Open Pro Class. After finishing second in her heat, Amy Penkowski settled for 3rd in the Knobby Motorcycle TT race behind Chris Faskett and Brian Richler. This was Amy’s first ever ice race. Chris Gettinger dominated the Sportsman Motorcycle final. In the Pro TT it was Roy Nafzger winning with Lance Wollin second. I had to settle for 6th in both the 250 Pro race and the Pro TT race. The 2002 ice racing season has been "iffy". The warm weather is great for racing but not for the ice conditions. But I do remember freezing my fingers trying to shoot video from the races over the years. I remember one time getting up in the morning and looking at the temperature on a bank sign saying –28 degrees. By the time we started racing it warmed up to a beautiful –18 degrees. Now, let’s see, -18 degrees times 65 mph on a motorcycle equals a wind chill factor of maybe –85 degrees. "O what fun it is to race on the ice!" All photographs above were taken by, and all rights retained by Marge Sierzega. Atlanta Results - Unofficial Class Champion! At the Willow Springs 24 Hour Enduro, the Team Chicago Yamaha YZF600 finished 4th in class and 13th overall! !